Hinsdale Mantel is a white marble fireplace. Carvings of leaves and beads show the beautiful. A traditional style mantel craved into a statue white marble. This real natural stone has less grey veins in it. There is both Italian and French inspiration in this design. The stock is limited on this item. Call to check if there is one available. We try to replenish stock regularly. 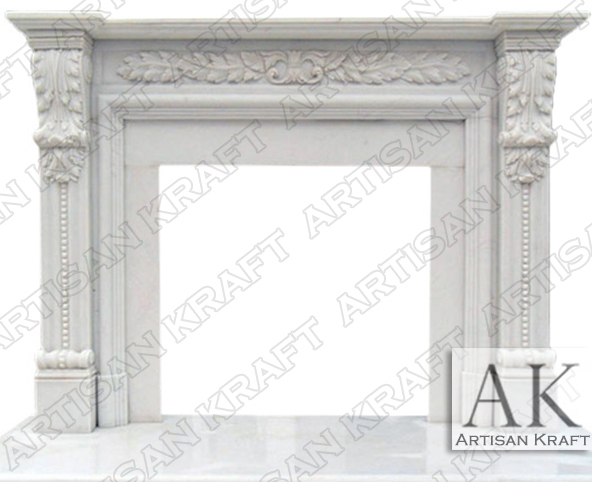 Artisan Kraft offers the highest quality MN fireplace mantels with designs ranging from baroque to modern. Old world surround traditions and modern innovation allow us to achieve the highest standards of quality in our fireplaces. Carved from beautiful slabs of natural stone including but not limited to marble, limestone, travertine, and sandstone. Stone: Grey marble, limestone, cast stone, limestone, sandstone, marble etc. Available in many different colors, textures and finishes. A white marble mantel the Hinsdale Fireplace. Available in stock. Here the Hinsdale marble fireplace is pictured in white marble fireplace mantel a great fireplace choice for the east coast.